EcoBreeze switches automatically between air-to-air and indirect evaporative heat exchange. 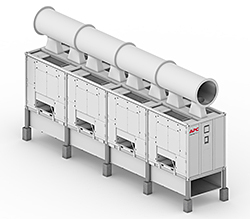 Located outside the perimeter of the data center, it prevents outside air from coming in contact with the data center air, regardless of which cooling mode is used. Features a proportional R410a refrigerant system as well as an onboard water treatment system. The 50kW modules can be grouped up to 200kW and 400kW of sensible cooling.